The 129th Art Discussion Group Meeting will be held on Wednesday 22nd April 2015 at 19.30hrs at MISCO OFFICES (first floor) in Fino Buildings in Notabile Road, Mriehel. 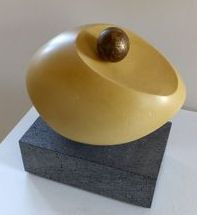 ADG is inviting Antoine Farrugia a sculptor who specializes in carving stone. He hails from Mqabba and since as a child he was surrounded by stone quarries he is obsessed about the material and regards stone as the womb of life. In March 2010 he obtained a diploma in Fine Arts from the Malta School of Arts after the encouragement and help he received from Anton Grech his master and mentor. ‘Pure Form’ is the title of an actual personal exhibition by the sculptor at ‘Galleria del Borgo’ at Stefania’s Sweet Boutique in Attard that opened to the public on the 16th of March and closes on the 15th of June 2015. Antoine will answer questions from the floor regarding his approach and technique in carving stone and marble. He will also elaborate about his career and some of his main works decorating public spaces. The works exhibited at the ‘Galleria del Borgo’ will be presented as images on screen, analyzed and discussed. ‘Pure Form’ crystallizes his work as his shapes are forms in space in perfect harmony and balance. Their simplicity is the hallmark of his oeuvre and since they are pure and perfect they are minimalist in essence. The profound harmony and balance of the modules produce a musical and lyrical rhythm that charms the heart and mind. His works are timeless though influenced by ancient and modern expression. There is a rare delicacy and unique elegance in his tactile works. He admires Costantine Brancusi and Henry Moore but is more attracted to the former than the latter as to inspiration and vision. In 2006 he was chosen together with 30 sculptors from around Europe to a symposium about sculpture in Germany. Finally to his satisfaction his work was chosen with that of four other sculptors to decorate a public space in Eastern Germany. Encouraged by this wonderful experience Antoine has never looked back. The sculptor steadfastly believes that an artist can imbue a piece of sculpture with the breath of life, with the force within; that he can endow it with magic and mystery. Quoting Antoine: ‘I know from where I came as I copied a lot…I know where I am going as I can create’. ADG invites all members and their friends and the public to enjoy meeting Antoine Farrugia the sculptor and share with him the beauty of his works.